I finished a custom. This one came together very quickly. 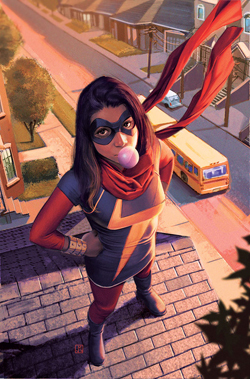 No, not the Ms Marvel you were expecting but the new one, Kamala Khan. She was Marvel's first Muslim character to headline a book. When I saw the new Mego's Facts of Life Tootie had lighter skin, I thought she would be the perfect base for a teenage Pakistani American. Red suit and blue boots from CTVT. Vinyl blue top with yellow vinyl details and a blue vinyl mask. I'm really happy with how she turned out!